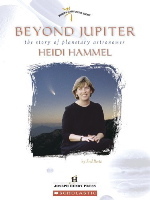 People who read Beyond Jupiter will surely want to know about the latest news in Heidi Hammel's life and work. This page will keep them up to date. On January 1, 2011, Heidi Hammel will begin a new position of leadership in the American astronomical community. The Association of Universities for Research in Astronomy (AURA) has announced her appointment as Executive Vice President, where she will serve as Deputy to AURA's president. As Executive Vice President, Dr. Hammel will play a major role in advancing AURA's mission to promote excellence in astronomical research by providing access to state-of-the-art facilities. Dr. Hammel's contributions to both the planetary sciences and astronomy are widely recognized. She has also played a major role in AURA as a member of the AURA Board (2003-2009) and as a member of the Space Telescope Institute Council (1996-1999). She has participated in community strategic planning in the recent Astro2010 Decadal Survey as a member of the Astronomy and Public Policy Working Group and as Chair of the Giant Planets Panel for the Planetary Science Decadal Survey. She has outstanding communication skills and is frequently invited to participate in public outreach events. Despite her new responsibilities, Heidi will not leave her research interests behind. She plans to continue observing the giant planets, especially Uranus and Neptune, and working with other astronomers as described in Beyond Jupiter. The closing paragraphs of that book discuss Heidi's future, and they still apply. Heidi gets so many requests for her time that she needs to choose carefully among them. Most scientists would make their choice based on what the committee will do for their careers, but Heidi doesn't think that way. She decides by asking herself the same thing she has asked at every turning point in her life: Which choice is most challenging and interesting? But I'm gonna go for it for sure. Now matter how much anyone plans, circumstances always bring unanticipated opportunities and challenges. The secret of success is recognizing opportunity, facing the challenges that it brings, and going for it--for sure. As Heidi begins the next chapter of her career at AURA, one thing is certain. She will recognize opportunities and apply her energy, enthusiasm, creativity, and determination to the challenges ahead. You by now probably know of the Gemini and Hubble observations. We also got some great Keck images tonight. I still have another night at Keck tomorrow, and then Sunday at Gemini. Hubble observations sporadically as well. Tiger by the tail! Heidi's excitement is obvious. We will be adding updates as this encore performance from Jupiter plays out. In the weekly New York Times Science section, reporter Claudia Dreifus interviews notable scientists. Her column on September 2, 2008 profiled Heidi Hammel as An Astronomer Devoted to the Icy and Far Away. he article doesn't mention Beyond Jupiter, but Ms. Dreifus read it and used its information for some of her probing questions. Heidi, who became famous because of her work with the Hubble Space Telescope during "the Great Comet Crash" of 1994, is one of the scientists involved in planning for the Hubble's successor, the James Webb Space Telescope. That orbiting astronomical observatory is scheduled to be launched in 2013. On March 5, 2008, Heidi was interviewed about that wonderful instrument and what it is expected to discover on Minnesota Public Radio's Midmorning program. Follow that link to read a summary of the broadcast or to listen to the entire 55-minute program. It begins with an interview, then moves phoned-in questions from astronomy-loving listeners. The November 29, 2007 issue of the national news magazine Newsweek included a profile of Heidi Hammel in its Business and Technology section entitled To Shoot for the Stars and summarized this way: "Astronomer Heidi Hammel keeps her eyes on the skies, where the universe is always full of surprises." That sentence could have come right out of the introduction to Beyond Jupiter, which states: "By opening her eyes to small but interesting details, Heidi is always prepared for the unexpected." Though Uranus' equinox will not take place until December 7, 2007, the planet's rings appeared edge-on to Earthbound astronomers, including Heidi Hammel, on August 16. While other astronomers were using the Hubble Space Telescope, Heidi was part of a team observing the event in infrared light from the Big Island of Hawaii at the Keck observatory. The image below is from a similar observation at the Keck in May 2007 when the rings were also edge-on as viewed from Earth. One of the rings that the team discovered last year (see "One ring, two ring..." below) is not detectable in the Keck data, Heidi notes. "The outermost ring is not visible in our infrared images. This ring is very blue, and therefore harder to see in the infrared." The team is certain to produce more dramatic images as the equinox approaches and passes. Stay tuned! On April 19, 2007, Heidi Hammel and Lowell Observatory Astronomer G. W. Lockwood published a paper about their analysis of Neptune's changing brightness over the past 50 years. Although they don't dispute that global warming on Earth is primarily caused by humans, they saw trends in Neptune's brightness that suggest that changes in the sun may also have some influence. The paper is a great example of how to challenge a widely accepted scientific idea that has become a "hot" political topic without getting wrapped up in the political argument. The scientific details are too advanced for this website, but adult readers may want to see what I say about it on my Science Blog. Readers of Beyond Jupiter know that Heidi Hammel has been expecting dramatic changes in the atmosphere of Uranus as its December 2007 equinox approaches. So it was rewarding but not surprising when this Hubble Space Telescope image of Uranus taken on August 23, 2006 showed a dark cloud that reminded some of Heidi's discovery of the appearance and disappearance of Neptune's "Great Dark Spot." The elongated feature measures 1,100 miles by 1,900 miles (1,700 kilometers by 3,000 kilometers). It has appeared at a latitude of 27 degrees in Uranus's northern hemisphere, which is just now becoming fully exposed to sunlight after many years of being in shadow. Astronomers are keenly interested in how strongly and quickly the atmosphere of Uranus responds to seasonal sunlight changes. "We have hypothesized that Uranus might become more Neptune-like as it approached its equinox," Heidi said in response to the discovery. "The sudden appearance of this unusual dark feature suggests we might be right." The Uranus imaging team, of which Heidi was a part, was led by Lawrence A. Sromovsky of the University of Wisconsin. Their astronomer colleagues on the project were Patrick Fry, also of the Univeristy of Wisconsin, and Kathy A. Rages of the SETI Institute. More images and additional information about Uranus's dark spot are available at the Hubble Space Telescope website. Because of the large tilt of Uranus' axis, its moons only cast shadows on the planet near the time of its equinox, which will take place in 2007. On July 26, 2006, Lawrence A. Sromovsky, Heidi B. Hammel, and Kathy A. Rages, using the Hubble Space Telescope, captured these images of Uranus' moon Ariel and its shadow on the planet's clouds. This is the first time such an event has been observed. Uranus' orbital period is 84 years, which means equinoxes are 42 years apart. At its last equinox, no telescopes on Earth or in orbit were capable of capturing the shadows of its moons. Click here for more details, including quotes from Heidi. and here for a NASA news release about the observations. Who says scientists don't have a sense of humor? Heidi Hammel and her colleagues Imke de Pater, Seran G. Gibbard, and Mark R. Showalter published an article in the 7 April 2006 issue of Science, one of the world's most widely-read and important scientific journals, and they gave it a subtitle drawn from Dr. Seuss. Comparing near-infrared and Hubble space telescope observations, they found that two outer rings of Uranus, discovered in 2003, were red and blue in color. Because of the approaching equinox on Uranus, the planet's rings appear nearly edge-on as viewed from earth. That increases their apparent brightness by compressing same amount of the reflected light into a narrower region, making it possible to determine their color. The newly observed rings are made of tiny dust particles. The ring color depends on the size of the dust grains rather than the material in them. That is due to a similar phenomenon to the coloration of soap bubble films or oil slicks, where the colors seen depend on the thickness of the film. Blue rings are very unusual, whereas red dust rings are much more common. This is only the second known blue planetary ring, the other being Saturn's "E ring." It means that the dust particles are particularly small. The researchers explain the size of the dust particles by analyzing impacts of bits of space rock on the moon Mab, which orbits within the blue ring. And Heidi adds this important tidbit: The paper was accepted for publication on 2 March 2006, Dr. Seuss's 102nd birthday. As the last chapter of Beyond Jupiter was being written, Heidi was busy observing Uranus for signs of changing weather as it approached its 2007 equinox. On July 4, 2004, when many people in the United States were enjoying Independence Day fireworks, Heidi and a team of astronomers were on Hawaii's Mauna Kea where they observed a different kind of excitement in the sky. They focused the Keck telescope's ten-meter mirror on Uranus, and used its image-sharpening "adaptive optics" capability to study the planet's atmosphere. The images included a type of cloud feature that reached to relatively high altitude in the southern hemisphere. Such clouds had only been seen previously in the north. Four days later, they discovered the feature's bright core had faded. They had seen Uranus' atmosphere changing before their telescopic eyes! Writing in the journal Icarus, Heidi and her team set the stage for more research, as they concluded with this question: "Are we at the beginning of a period when such ...bright features will become more common" because the planet, with its enormous seasonal differences in sunlight, is now approaching the time of its most rapid atmospheric change? They suspect that the answer is yes and that even bigger surprises lie ahead. Whatever they discover, the results will be added to this webpage as Heidi continues to write new chapters in her remarkable life story. Heidi Hammel was one of the scientsists whose April 2005 images of Neptune are part of this spectacular set of NASA photographs and a time-lapse movie showing Neptune's changing atmosphere and its orbiting moons. "This time-lapse movie of Neptune was assembled from combining NASA Hubble Space Telescope images taken over a 15-hour period. The movie shows a dynamic atmosphere and captures the fleeting orbits of Neptune's satellites. The natural color and enhanced color views of Neptune were assembled from images in 14 different colored filters. This allows atmospheric features to be seen above Neptune's methane haze, which gives the planet its blue-green color. "The animation has four sections, each one corresponding to approximately one rotation of Neptune. "The first section shows Neptune and its largest satellite Triton, which is about as large as our moon. Probably a captured Kuiper Belt object, Triton orbits Neptune in a "backwards" or retrograde path relative to the other major satellites, and opposite to Neptune's rotation. The view is close to what a human eye would see looking through the Hubble Space Telescope. "The second scene zooms in on Neptune, and the colors have been enhanced to better show the subtle detail of clouds in Neptune's atmosphere. "The third scene has the spectral region of light changed from the visible to special methane bands in the near infrared. Most of Neptune's atmosphere becomes very dark, except for high-altitude clouds. "The fourth scene traces the satellite orbits. Four of the small, inner satellites are visible orbiting Neptune. Dutifully obeying Kepler's laws of planetary motion, the outer moons take longer to revolve around Neptune than the inner ones. From outside to inside, these satellites are Proteus, Larissa, Galatea, and Despina. These moons are so faint that only the longest Hubble exposures can capture them. "The outermost layers of Neptune's thick atmosphere do not rotate like a solid body. The polar atmospheric regions finish a full rotation in a speedy 15 hours, while the equatorial regions lag behind, taking more than 18 hours for a complete circuit of the planet. Return to the main Heidi Hammel page at "Dr. Fred's Place"